Myasthenia gravis (MG) is a neuromuscular, autoimmune disease characterized by fluctuating weakness of muscles, made worse by using those muscles and improved at least partially by rest. MG can strike anyone at any time; however, it frequently targets women of child-bearing age and men in their fifth or sixth decade of life. 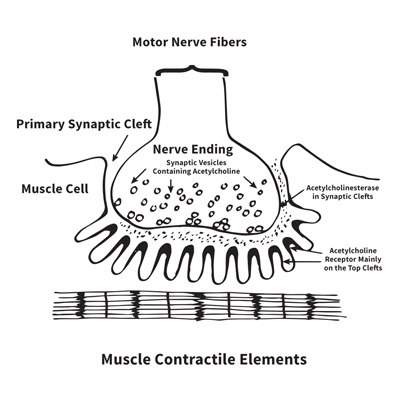 Normally, a nerve signals a muscle to move. This happens because acetylcholine receptors, a protein on the muscle surface, bind and respond to acetylcholine, a chemical neurotransmitter, that’s released by the stimulated nerve and causes the muscle to contract. With MG, the body’s immune system mistakenly attacks and destroys its own acetylcholine receptors. Because of this autoimmune attack, the response of that muscle to nerve impulses is reduced and weakness occurs.